Can Stress Cause Hot Flashes? Hot flashes during menopause are extremely common, and about 75% of women in the United States experience them. At the same time, about three-quarters of Americans in general experience moderate to high levels of stress daily. Though the main cause of this sweaty symptom is hormonal, it is made much worse by anxiety. The physical processes that take place in your body when you are stressed are inextricably linked to the feelings experienced during a hot flash. Luckily, there is extensive research into relaxation techniques for diminishing these uncomfortable sensations. Stress is an important survival functionality of the body that helps one escape dangerous situations. However, for people who become stressed over non-life threatening things - as many do - it will have a negative impact rather than a positive one. What happens internally is that when you feel nervous or tense about something in your life, the amygdala in the brain, which controls emotional processing, sends an alert to the hypothalamus. The hypothalamus then cues the body with a burst of energy to respond effectively. Cortisol, a stress hormone, is then released to maintain the rush. Read about unexpected causes for hot flashes. The said burst of energy is made possible by the release of epinephrine, also known as adrenaline. The reaction causes your muscles to tense, your breath and heartbeat to quicken, and sweat to pour. As a result, your body temperature will go up, and you can become flushed and panicky. If you've had a hot flash, this may sound very familiar, since the same side effects occur. Though the hypothalamus can also be set off by the decrease in estrogen levels during menopause, the intensity is nearly doubled by stress. If you are prone to severe hot flashes, you may want to ask yourself if you hold a lot of tension unnecessarily. A study conducted at the University of Massachusetts Medical School observed that women who attend mindfulness-based stress reduction classes experienced a 40% decrease in hot flash severity. These classes combined with yoga and meditation, which both aim to lower blood pressure and promote emotional, physical, and spiritual well-being. Another study observed the effects of paced breathing on hot flashes. Participants were to take five-second slow inhales deep into their belly, followed by a five-second exhale, repeated for 15 minutes. In nine weeks, those who practiced this twice a day had 52% fewer hot flashes, and those who practiced this once daily had 42% fewer. Read about natural ways to manage hot flashes. 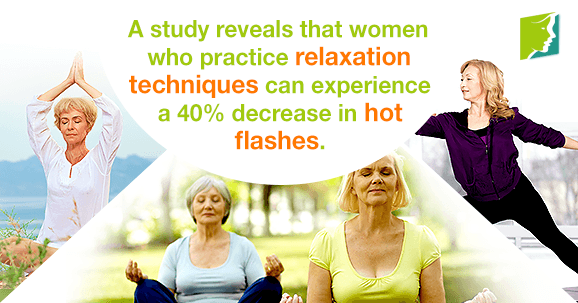 In conclusion, it is wise to practice some form of relaxation to greatly reduce your hot flashes. Whether you do yoga, tai chi, or take a walk through the park, you will be better able to keep your cool. If you would rather be still, practice the paced breathing as described above, or meditate for 20 minutes daily. This will allow you to be part of the 25% of people who do not experience significant stress, helping you to improve your overall quality of life. Why Do I Have Extreme Hot Flash Episodes? While some women undergo the menopausal transition without incident, most will experience some combination of the 34 menopause symptoms.Worried about hot flashes? There are several reasons for these annoying symptoms and plenty of solutions as well. Tea may be a good idea if you suffer from hot flashes. Click here to learn more about managing hot flashes effectively.